Marshall M. Fredericks Sculpture Museum | Detroit Mayor Coleman A. Young presents Mayor Nishiyama of Toyota City, Japan with a small-scale bronze of "The Spirit of Detroit"
“Detroit Mayor Coleman A. 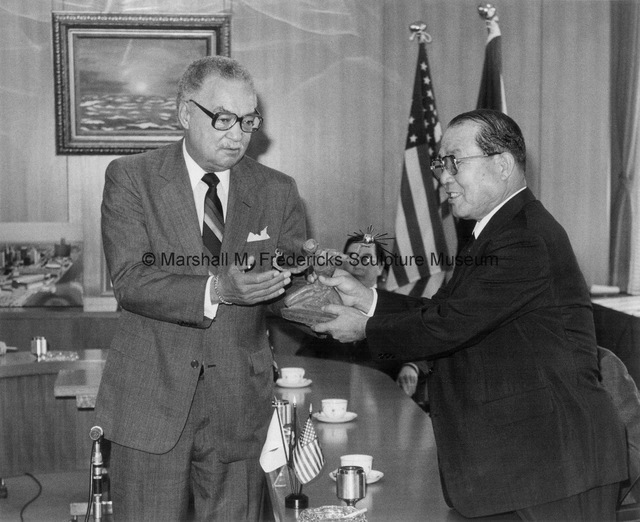 Young presents Mayor Nishiyama of Toyota City, Japan with a small-scale bronze of "The Spirit of Detroit",” Marshall M. Fredericks Sculpture Museum, accessed April 22, 2019, http://omeka.svsu.edu/items/show/5045.